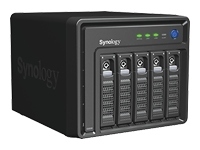 DS508 is designed with hot-swappable HDD and RAID 1/5 protection, as well as Windows ADS authentication, USB printer sharing, dynamic website hosting, and data backup. DS508 keeps business data available 24/7. DS508 provides speedy data transmission and powerful computing capability, which is not only suitable for corporate environments that demand on efficiency, but also a great choice for power users who massively access data on the server. DS508 is compatible with Windows ADS domain. Windows domain users are able to access data shared from DS508 when they pass the active directory authentication. This will greatly save your time on creating large amount of accounts for the domain users. Data backup is so important but people tend to ignore it, DS508 makes data backup so complete and automatic that backup always be done without your attention. You can always find the backup alternatives that fit your needs.